Many new entrepreneurs just getting started with their first business will do so from the comfort of their own home. However, working from home can be a serious adjustment, especially if you’ve spent years working in a much more structured office environment. 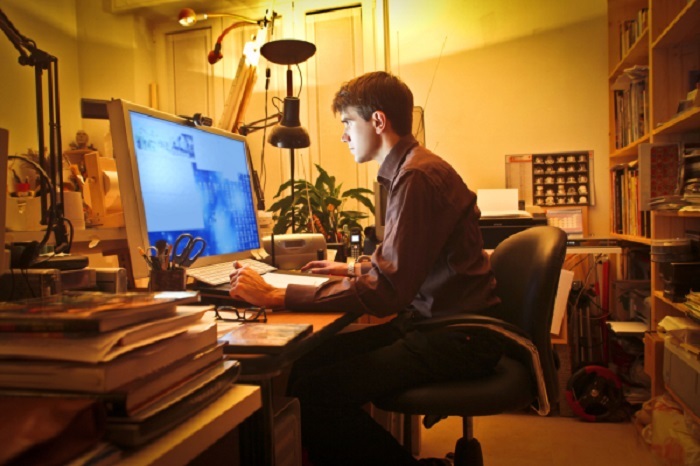 work space should be as free of distractions as possible so that it’s easier to stay focused. Find out when you’re most productive. When you’re working from home, you have the luxury of setting your own hours. This means you should attempt to work when you know you’re going to be most productive. Maybe you’re a morning person, and you work best early in the day. Maybe you need a little extra sleep and would like to start later in the morning and work into the afternoon. Whatever works, schedule your work sessions when you’re most productive. Make sure others respect your work hours. You’ll likely soon find out that people will know you’re working from home, so they’ll ask you to run an errand or help them with something during the day because you’re “free.” Politely remind them that you’re not free just because you’re at home; you’re still working. Even if it’s a task that just takes a half hour to an hour, it’s keeping you from getting important work done. Stay organized. When working from home, you might not be as inclined to regularly clear off your work space and stay organized. However, keeping your work area clear of clutter can really help you to stay focused and in a productive mindset. Resist the urge to open multiple tabs. The more tabs you open in your browser, the more likely you’ll get off track by browsing Facebook, checking the news, reading about your favorite sports team and any other kind of distractions. You might even consider putting temporary blocks on certain websites that act as distractions during your work time. These are merely a few suggestions to help you stay on the ball while working from home. For more tips, speak to us today at Viral Solutions.